Bat Masterson is a gambler, empire-builder, Indian-fighter and journalist. He uses his derringer and gold-headed cane to win the justice he believes to be right. The Canvas And The Cane: Connoisseur and man-about-the-Frontier Bat Masterson becomes interested in a painting purchased by his friend Teresa Renault. There is some question as to the authenticity of the picture and Bat stakes a large sum on his conviction that it's the real thing. Wanted - Dead: In a determined stand on the side of Justice, Bat Masterson puts himself between a trigger-happy sheriff and a reformed gunman who is involved in a recent killing. Bat, unlike the sheriff, believes that every man is entitled to be heard in court, before declared "guilty." To The Manner Born: Bat Masterson resorts to duelling pistols to expose the cowardice of self-styled "Colonel" Marc James, Confederate deserter. Bat ends the "Colonel's" career as gambler and blackmailer, to pay a debt of gratitude to Mr. Chancellor, whose daughter Abby is being terroriz- ed by the "Colonel." No Funeral For Thorn: A true friend to his friends, Bat Masterson rushes to the bedside of dying Thorn Loomis. He's caught in the cross fire when two battling for the privilege of being named county seat. Side by side with his "dying" friend, Bat tries to outgun the Wichita Kid and writes his name big in the history of the State of Kansas. Shakedown At St. Joe: You can't be sure that Bat goes to the local opera house at St. Joe, Missouri because he's a music lover. Reason for doubt: an ex-girl friend Dora Miller - whom Bat finds as attractive as ever. The Death Of Bat Masterson: Most-Alive-Man-on-the-Frontier Bat Masterson is pleased to announce that reports of his death are much exaggerated. When he tries to with draw on his account in a Bonanza, Colorado bank, he learns the account was closed out and that he, himself is "deceased." Lady Luck: Man-of-High-Principle Bat Masterson takes a firm stand when two beautiful girls and their father are blackmailed. The scene of the activity is The Lady Luck, one of Sacramento's gayest gambling casinos. Dead Men Don’t Pay Debts: Peacemaker Bat Masterson calls a halt to a deadly gun-shooting feud between the Clementses and the Bassetts. Bat claims the right to interfere because of money owed him by the Bassetts. Lady Luck: Man-of-High-Prinicple Bat Masterson takes a firm stand when two beautiful girls and their father are blackmailed. The scene of the activity is The Lady Luck, one of Sacramento's gayest gambling casinos. Who’ll Buy My Violence: In the history of American commerce, Bat Masterson is probably one of the first to take a firm stand for "fair trade." Buying one of his famous bowlers at Sharon Stabler's store, he's outraged by the price. Reason for the exorbitant tab: Barney Kaster has a monopoly on riverobat cargo. Bat's reward for breaking Kaster's hold on Whistle valley is a new "iron-hat." Bat Plays A Dead Man’s Hand: Versatile Bat Masterson turns lawyer to fight the tyrannic rule of Phil Hood. Hood uses the law to his own ends, stifling the freedom and life of the town. Bat's mission: rescue the town. Garrison Finish: It's Bluegrass thoroughbred versus Western quarterhorse when General Moran wagers a railroad that his Bluegrass racer can beat Colonel Pierce's mount. Suspicions grow in the general however, and he asks Bat Masterson to help him. The Inner Circle: Equal rights for all is Bat Masterson's motto in his fight against the "Inner Circle." The all-male Inner Circle is determined to keep the women from voting. Bat, however, espouses the cause of female suffrage and finds himself knee-deep in trouble. The Pied Piper Of Dodge City: The famous "Peace Commission" photograph - a treasure in the archive of western history - results from a unique adventure involving Bat Masterson, Luke Short, Charlie Basset, Wyatt Earp, Neal Brown, Bill Harris and Frank McLean. Bat imports pretty Dolly McGregor to play the piano in Luke short's saloon. Rival saloonkeeper Mayor Webber changes city ordinances to outlaw Dolly. Bat using bad conditions of Dodge City law as a lever, gets the governor to set up a peace commission. The Commission is made up of the law - and their second chore is to sit for the famous Peace Commission picture. The first chore: get rid of Webber and clean up the town. A Picture Of Death: Bat Masterson's intrigued by the ancient and honorable question: Are all four of a trotting horse's feet off the ground at the same time? Bat has affirmative opinions on the subject - and readily puts his money where his opinions are. Flume To The Mother Lode: In order to carry on as a gold miner, Bat Masterson becomes party to a timber war. Reason: A competing prospector, in order to prevent Bat from bracing the tunnels in his mine, makes a grab for all available timber. Death By The Half Dozen: Kidnappers force Bat Masterson to deliver a ransom note. The victim, a young bride, is saved but Bat has a job of rounding up the outlaws. Pigeon And Hawk: Empire Builder Bat Masterson becomes involved in a "coup" involving a valuable black mining stock on the Denver market. Would-be tycoons Lee Baxter and Willard Wynant employ ex-Pony Express riders to bring them advance a news of shifting silver values and mine conditions to get a jump on other speculators. Deadly Diamonds: Sometime silver-miner Bat Masterson believes the "proof is in the mining." Suspecting a hoax is being perpetrated on the citizens of Leadville, Bat buys into a mine of questionable worth. The outcome: he wins the unstinted gratitude of the entire boomtown. Mr. Fourpaws: On a seemingly routine trip to investigate a shortage in a small town bank, Bat Masterson finds a dead man, makes the acquaintance of a larcenous dog, and is very nearly killed himself. He subsequently meets a most charming lady. With the dog's help he restores the bank's money, solves a murder, bringing the killers responsible to swift justice, and reluctantly takes leave of his lady fair. Six Feet Of Gold: Bat Masterson finds himself doing a most unwelcome "land office business." Accepting a parcel of wasteland from Lisa Truex in payment for a debt, he decides to turn it into a grave yard. He subsequently finds that through hanky-panky at the Land Office, he has been branded a swindler. Cattle And Canes: It's cane against guns when Bat Masterson steps them into a range war. Having chosen his side of the fight, he's not responsive to being urged at gunpoint to become "turncoat" to the people he favors. The Disappearance Of Bat Masterson: Bat Masterson may not be able to pull rabbits out of his famous derby but legerdemaine isn't a complete mystery to him. Sleight-of-hand artist Herman the Great disarms a cowboy - but the trick doesn't work when bandits try it on Bat. The Snare: Bat Masterson rides the trail alone into the gun of the Yaqui Kid toward almost certain death. The Kid, a heartless scoundrel, has killed a friend of Bat's. In pursuit of the killer, the sheriff is murdered and the posse fails. So Bat has determined to "go it alone." Three Bullets For Bat: It's the rifle-squad at dawn and his back to the wall for Bat Masterson, because of a strange adventure involving nonexistent gems. Bat's been "conned" into trailing some supposedly missing jewelry and ends up in Mexico - That is, nearly ends up. The Reluctant Witness: Bat Masterson tries a poker bluff in an effort to save Ellie Winters from a murder charge. The "reluctant witness" on whom Ellie has been depending to save her, fails to show up. Bat enlists Wyatt Earp to handle her case. Come Out Fighting: Boxing-Fan Bat Masterson, arrested enroute to a championship bout, finds himself arraigned before infamous "fining judge," Malachi Brody- a formidable and vindictive man of the law. Stage To Nowhere: Stagecoaches disappear when Bat Masterson executes a plan to thwart road agents. The highwaymen's quarry is silver bullion being transported in the stagecoaches. Bat's ingenius plan to frustrate the thieves is an early milestone in crime busting history. Incident At Fort Bowie: A horse thief hijacks a herd of cavalry stock from horse trader Bat Masterson. Bat's problem: find and deliver the horses - and bring the criminal to justice. 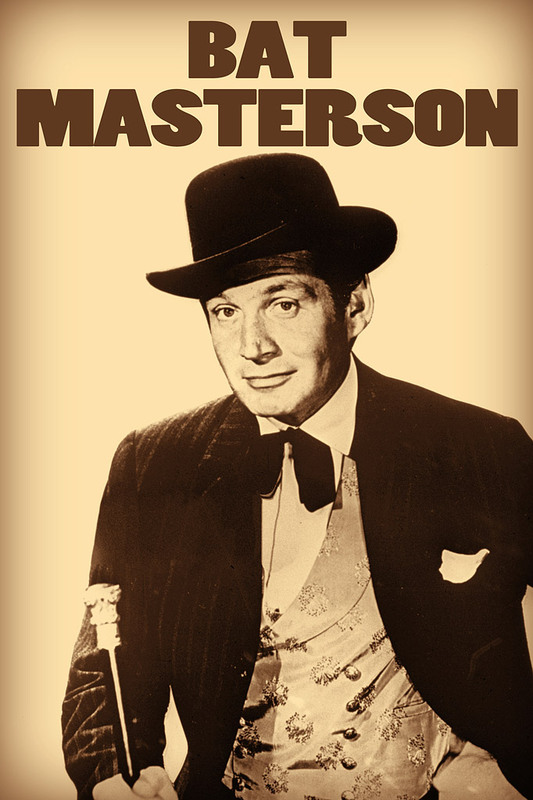 Masterson’s Arcadia Club: Underworld character Mace Gunnison takes over the town of Liberal, Kansas and appropriates Bat Masterson's name and identity. As proprietor of "Masterson's Arcadia Club," Gunnison fleeces townsmen and trail-hands at crooked games of chance and with third rate liquor. His MO: If anyone squawks, jail him, then post him out of town. Bat, galvanized into outraged action, clears his name and makes Gunnison pay the townsmen their illegal losses. Welcome To Paradise: Bat Masterson is "held up" for an exorbitant fine when he rides into the town of Paradise, Colorado. The charge: carrying fire arms. In Paradise, the Law says "no guns" which puts the "man with the cane" at a great advantage. A Grave Situation: Bat Masterson baits a trap with more than $15,000, in order to catch cattle thieves, preying on the herd of his friend Hugh Blaine. This leads to a fight for his life, in which Bat digs his own grave. Wanted - Alive Please: Bat Masterson accomplishes one of his greatest public services when he stops the smuggling of diseased cattle across the Rio Grande into the U.S. Alert to the frightful danger to healthy American stock, he had volunteered for the most unusual task of guarding the border single handedly. The Elusive Baguette: Bat Masterson plays bodyguard to a reigning San Francisco beauty and her fabulous diamond...This makes him prime suspect when the gem disappears. In one of the greatest demonstrations of the effectiveness of his cane as fighting weapon, Bat clears himself and catches the culprit. The Big Gamble: Prospector Steve Fansler is the most recent of a long line of gold seekers who disappear enroute to the famous Lost Dutchman Mine. This is of special interst to investor Bast Masterson who staked Steve to his expedition. Bat sets out to solve the Lost Dutchman mystery. Blood On The Money: In the search for the young man to whom he is carrying a bequest, Bat Masterson buy information from a cattle baron. The man fails to give him value received and Bat is misled and cheated - but not for long. Barbary Castle: Not everybody knows somebody who has smuggled a whole castle into the United States...but Bat Masterson knows one: Captain Angus MacLeod. The "old salt" has brought in a Scottish Castle, stone by stone, and set it up in San Francisco. Gold In Where You Steal It: It's fiesta time in Southern California when Bat Masterson becomes involved with a Spanish beauty and a bandit who terrorizes the region. Bat finds himself in the pleasant and profitable position of giving judgement between old loyalties and new laws. Debt Of Honor: Bat Masterson's friend "Cactus Charlie" Hayden strikes gold. When he repays Bat for staking him it's revealed that the gold is part of a missing shipment. Bat and Hayden set out to make the best of a bad situation - and do so. Law Of The Land: Though his sympathies lay with the open range cattleman in their fight against their old enemy, the railroads, Bat Masterson doesn't countenance their lawlessness. The cattlemen strip out 50 miles of railroad fence intended to keep the herds off the tracks. So, Bat finds himself in opposition to his friends. Bat Trap: Bat Masterson, the Frontier's best turkey-shoot judge, has his hands full at Midas Creek. The town council hires him to serve a double purpose - judge the turkey-shoot and make sure that bully-boy Rance Fletcher doesn't mess up the fun. The Rage Of Princess Anne: Investor Bat Masterson, in partnership with mine owner Augustus Ulbrecht, reaps the wages of mismanagement. Ulbrecht, indifferent to the safety of the men, forces them to work despite reports that the diggings are about to cave in. Though Bat wants no part of the blame, he doesn't walk out on his responsibility. The Hunter: When Sir Edward Marion unexpectedly downs a famous "fast gun," he attains a certain dangerous notoriety. This brings him to the notice of Bat Masterson with whom he exchanges some unusual demonstrations of fancy gunsmanship. Murder Can Be Dangerous: Gambling Hall Owner Bat Masterson is mystified when business booms but profits plummet. Investigating, he finds his partner's fingers in the cash drawer - and slams it shut. High Card Loses: Gallant Bat Masterson turns Cupid's little mailman. When the man escorting three mail-order brides to Noble Creek, is shot, Bat becomes his replacement. For some unknown reason, a certain "hot gun" doesn't want the gals to arrive. Dakota Showdown: Sheriff-maker Bat Masterson has his work cut out for him after brothers Jeb, Gus and Jocko Dakota gun down the lawman in their town. Their purpose: they want a free hand in operating their rackets. Last Of The Night Raiders: The Dooling boys - one of the roughest crowds on the Frontier - terrorize Angie Pierce and her son. Having escaped the hooligans, Angie seeks Bat Masterson's protection against them. Last Stop To Austin: Loyal friend Bat Masterson sees in a youthful gunslinger the image of an old friend who had died in an Indian battle years ago. He sets out to discover if the trigger-happy boy is the orphaned son of his friend. A Time To Die: Poker champ Bat Masterson has important testimony to offer at the trial of H.C. Smith, charged with murdering Bat's friend during a card game. Gunning people seems to run in this particular branch of the Smith clan as the father of the accused makes bloody threats against Bat and other witnesses for the prosecution. Death By Decree: Shot Gun Falls' gambling casino, with a string of debts tied to it, falls to Bat Masterson in the will of a gambler friend. When, suddenly Bat is pressed for payment on the mortgage, he discovers the property's value has unexpectedly increased. Bat discovers a conspiracy between the town marshall and a "trigger" to swindle him. And, with gun and cane, he goes after them. Net profit Twelve and half dollars.